I’ve previously posted about a new study which found that standardized testing may measure how well a school is doing on training students on lower-level thinking skills needed to do well on…standardized tests, but has practically no value in measuring “fluid intelligence” abilities like ability to transfer knowledge in one area and apply it towards solving a problem in another. There have been a number of articles about it in other places since that, so I thought I’d reprint what I wrote and add links to a few of them. In addition, I’m adding this list to The Best Posts On How To Prepare For Standardized Tests (And Why They’re Bad). The study comes from The Massachusetts Institute of Technology, and you can read their summary here. Here’s an interview with one of the study’s authors, which I think is even more interesting. He’s very careful with his interpretation of its results — a characteristic that I wish other researchers . Study: High Standardized Test Scores Don’t Translate to Better Cognition is another article and video about the same study. It’s from U.S. News. Standardized Achievement Tests: What Are They Good For? Hint: Not Cognitive Ability. is from Scientific American. 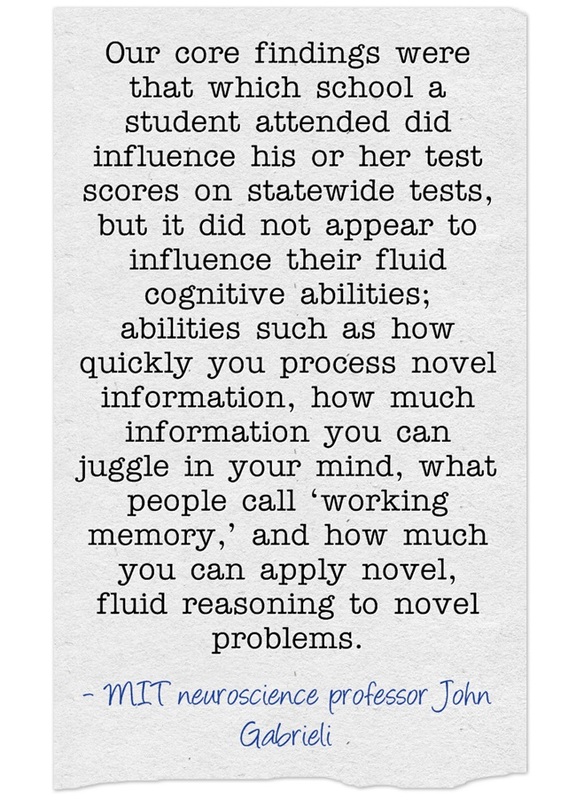 Study: Test-score gains don’t mean cognitive gains is from Valerie Strauss at The Washington Post. MIT Researchers: Higher Test Scores Do Not Translate into Higher Levels of Thinking is by Diane Ravitch. What Are Tests Really Measuring? : When Achievement Isn’t Achievement is by Paul Thomas.